The remix of Clamato Bloc Party is actually a misnomer with respect to the music industry. The remixes of the Clamato Bloc Party standards are not "new" mixes of the songs with additional instrumentation, systhesized or otherwise. 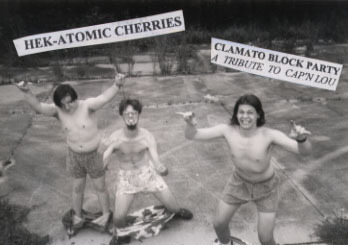 Sometime During the fall of 1995 and the spring of 1996, the master tape of Clamato Bloc Party disappeared. Charles and Wes were in the midst of finishing their freshman years at their respective colleges. Stephen contacted Wes to let him know of the unfortunate turn of events. At that time, it was decided that, in order to meet public demand for the album, a new mix must be made in order to produce new copies for sale. The new mix is superior to the original in quality, however, it lacked the "originality" and "penache" of the original mix. Otherwise, there is no significant differences in the material.